Shakhriyar Mamedyarov defeated Anish Giri in ninth round of Grand Prix in Beijing and took the sole lead in the tournament. Boris Gelfand lost few chances to win against Wang Hao and the game finished in draw. Alexander Grischuk drew against Alexander Morozevich and placed half a point behind of Shakhriyar. Veselin Topalov and Peter Leko share the third place with 5 out of 9. Mamedyarov and Grischuk are still tied for the first place after eight rounds at Grand Prix in Beijing. The leaders made two draws with Black pieces and keep one point distance from their nearest rivals Peter Leko and Veselin Topalov. Former world champion outplayed Sergey Karjakin, who lost the third game in a row while Peter Leko drew against Gata Kamsky. Boris Gelfand, who was suffering in Grand Prix after his success in Moscow, managed to win today against Vassily Ivanchuk. Alexander Morozevich made a draw against Wang Hao. 13th of July is a free day. The ninth round will start on 14th of July at 3 p.m. local time. 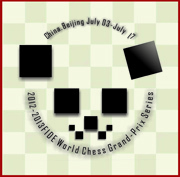 In the seventh round of Grand Prix in Beijing White took full revenge over Black by scoring five points. The playing day started with two quick victories of Wang Hao and Shakhriyar Mamedyarov against Anish Giri and Veselin Topalov respectively. Shakhriyar won the second game in a row and jumped on the first place while his nearest rivals Sergey Karjakin and Alexander Grischuk were still playing their games. After 6 hours of play Sergey Karjakin dramatically lost against Peter Leko while Alexander Grischuk defeated Wang Yue after almost 7 hours. As a result, Mamedyarov and Grischuk share the first place one point ahead of Karjakin, Leko and Ivanchuk. Ukrainian player defeated Alexander Morozevich and has +1 after 7 rounds. The only draw happened in the game Kamsky-Gelfand. Round 3: Sergey Karjakin increases lead in Grand Prix in Beijing to one point.